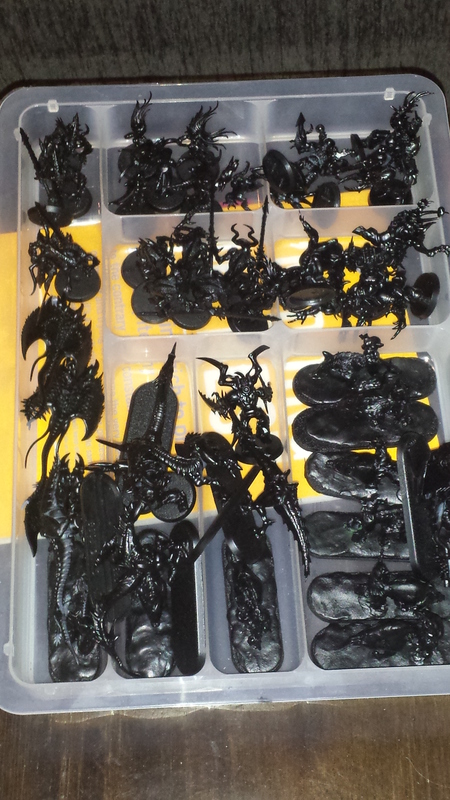 One day, this box will be painted. Priming is my new favorite thing. I didn’t really understand what it entailed, before; largely this is due to not having touched a can of spray paint. Now that I’ve primed, after my…no, I won’t make that joke. Suffice to say that the instructions I received were helpful and I was able to wield spraypaint with some proficiency. So I did. I managed to run through my entire can in under a week…I think. I don’t know how long a single can of black spray should last, but eventually the can was spitting and fizzing and not really working. It gave up the ghost painting Ephialtes, so he’s got a variable-quality coat, but I think it’ll add some fun elements to actually painting his metal legs. I also have roughly 10 Seekers who need coatage, so at some point another can purchase is in my future. 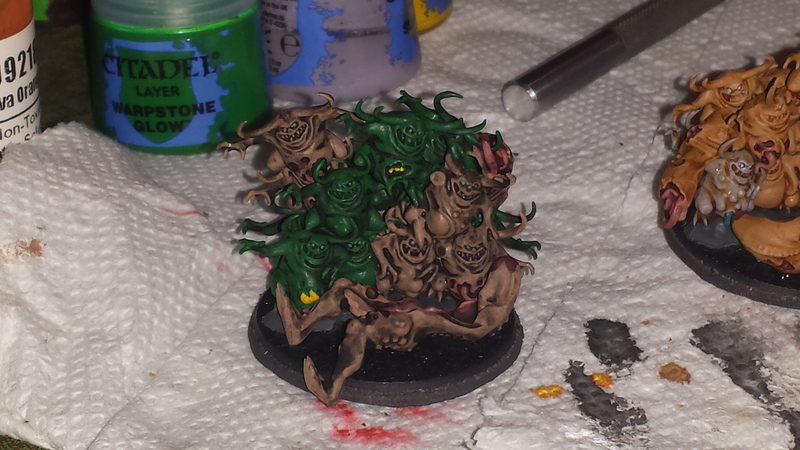 This week, other than priming, my primary painting project’s been Nurglings. I don’t actually run them, and am not sure I have any plans to, but I’ve had 3 bases’ worth since my first battleforce and with a second b-force in the house, I figured it was time. 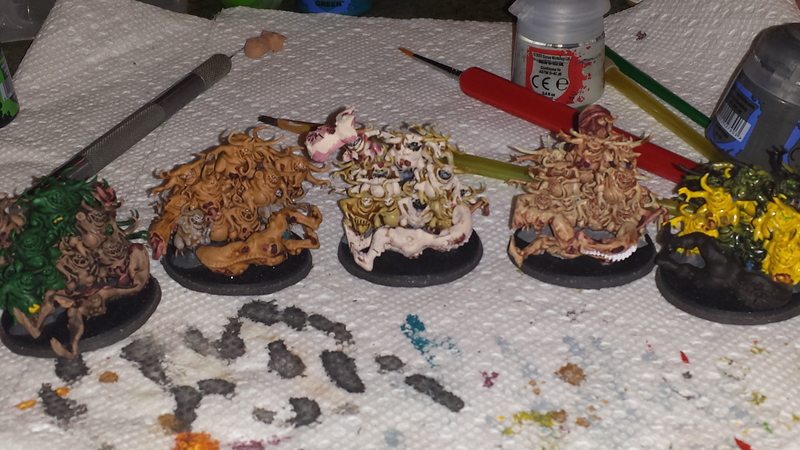 I did up five, leaving the last base to be constructed as a toggle nurgling base/palanquin of Nurgle. I’m quite happy with how the buggers turned out. 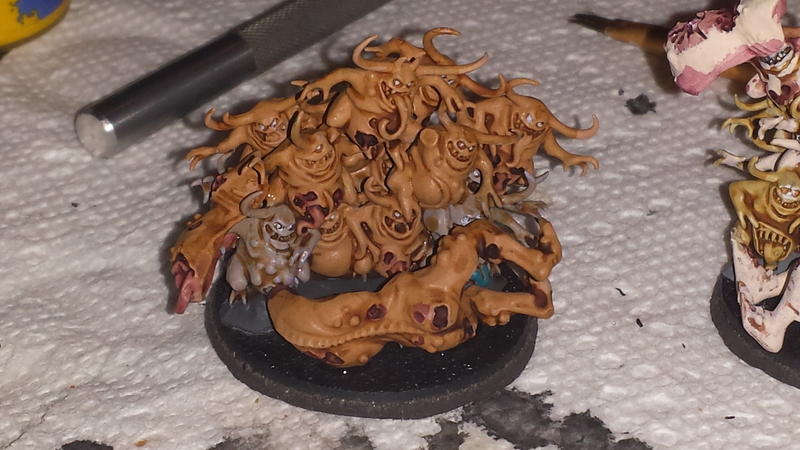 I know I could go in and add more detail, more colors, but that’s not really how I envision nurglings. I mean, these speak for themselves! I see them as nascent, utterly disposable masses of chaos, larval masses, where the horns and even tongues are made of the same Warp mass as everything else. Though I could see adding something to the green on these fellows. 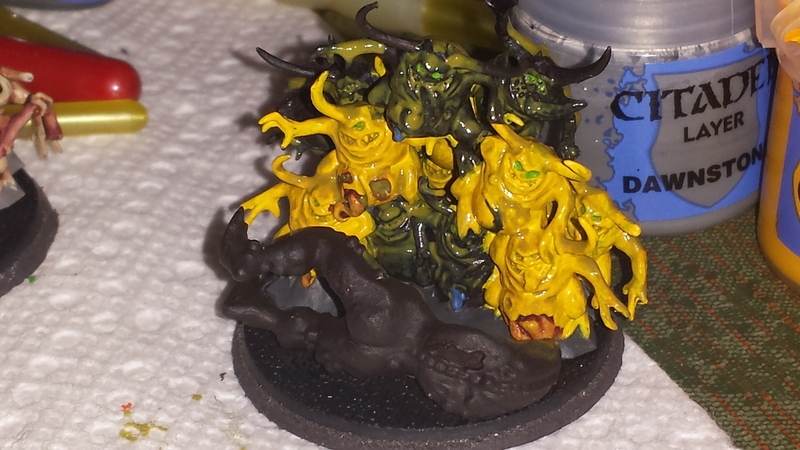 If I was displaying “mature” nurglings, like on my chaos bikes, I could see going into more detail. 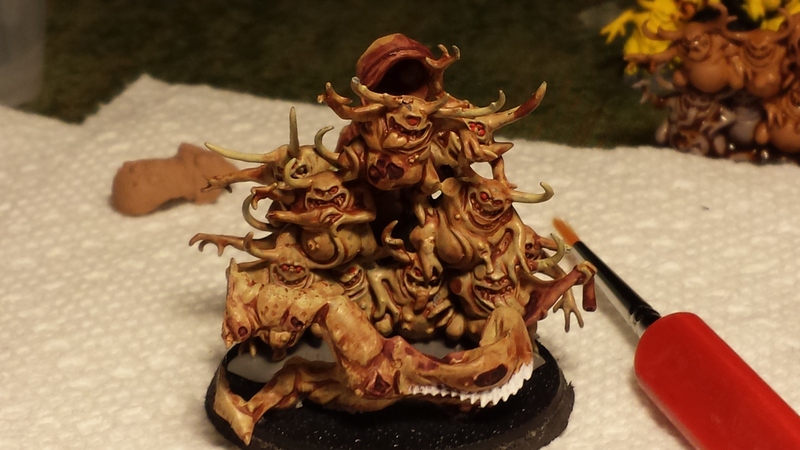 So this was a fun, harmless diversion where I got to play a lot with washes and layers and even base positioning. It also served, I think, as good prep for either going into mass formation painting (20 troops to paint, and more if I assemble the 5 plaguebearers who didn’t give their lives to the nurglings) or tackling my three honkin’ cyberdaemons. Tonight I finally cracked into my daemon prince box, and for my first DP used a whopping two pieces from the box: a head and the CSM chestplate. 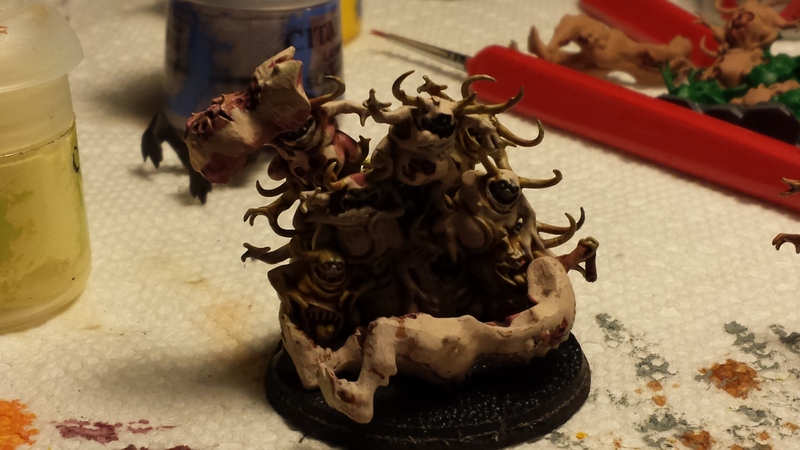 He’s curing now, but I’ll get a picture of him up tomorrow; I think he’ll be my go-to DP for CSM HQ, so that my Ghastly Grinner’s tentacle arm won’t look out of place when he isn’t rocking the Lash of Despair.